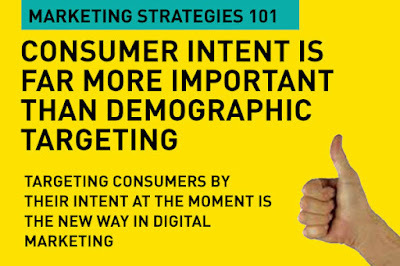 Home » advertising » marketing » Intent is the new black in digital marketing. In-the-moment marketing is what's hot. Google has defined four key moments when we are online. When a need arises, consumers quickly turn to Search on, say a Google and a YouTube to find a resolution to that need. These needs arise when a consumer wants to know something, wants to go somewhere (on a holiday, to a restaurant, to a business location), wants to do something and wants to buy something. Simply put, these are the four basic need states that digital marketing needs to answer. Marketing used to be, and pretty much still is, about targeting an audience depending on who they are, where they are, what they do generally. It's about their 'identity'. But bigger than that today, and bigger than what their demographic group habits are is the intent in the moment. It is about immediacy. And, most of this new wave of targeting is based on the fact that consumers today quickly turn to their smartphones for immediate resolutions to their needs. Google underlines their stand "Understanding consumer intent and meeting their needs in the moment are the keys to winning more hearts, minds, and dollars." The key to discovering intent is listening, and particularly when it comes to providing the right content that will resonate with your target, social media listening is critical. Age, gender, occupation, geography, group behavior are all important, but if that's all you use to target an audience today, your marketing is so last year. Your demographically targeted consumer may seem like just someone who would convert to purchase, what you don't know at all from that is their actual 'need-state' at the time that your content or your online or mobile ad hits their eyeballs. It does not give you the opportunity to connect with exactly those people who are looking for that something at that exact moment in time. Do you have the right content strategy – and is it geared for answering to the needs of your audience at the right time and in the right context? Google shares the success of Home Dept as a brand in the US that totally gets 'need-state' based content as a resolution that pushes their products far more than anything else. "Home Depot is a real-life example of a brand that understands the power of intent. Years ago it figured out "do-it-yourselfers" were turning to their phones—especially YouTube—to learn everything from "how to tile a bathroom floor" to "how to build an outdoor fire pit." So to be more useful in these I-want-to-do moments, Home Depot built a content marketing strategy centered around "how-to" videos on YouTube. Today the collection has hundreds of videos, with the top 10 videos each reaching a million views or more. The full Home Depot "how-to" collection has received more than 48 million views." says Lisa Gevelber, Google's VP of Marketing. In this new era of marketing, your strategy should be set for the new era. Get it right, and avoid making these crucial mistakes. Your new age mantras: Be There. Be Useful. Add Value. When your target audience turns to search and is looking for a solution to their need, you need to first be there. Whether in the form of searches, app interactions, mobile site visits, or even YouTube video views, these need based micro-moments happen constantly. Just being there with the right search results, the right content, the right message is key. What you really must focus on is to be useful for your audience at that moment – that's providing value in the immediate, in the now. An amazing statistic emerges from Google "Our research shows 51% of smartphone users have purchased from a company/brand other than the one they intended to because the information provided was useful." You need to really think seriously about unique, tangible ways your brand can help solve a problem or make life easier in real-time during a micro-moment. And, you can only do that if you start with the right consumer insights. Providing value, providing resolution to a need in the moment is key. You may find that women seek different answers – and that insight could be a starting point, but what do they want at that moment is more important. Start with getting your mobile marketing strategy right (see how here). With the proliferation of smartphones, our world is in a whole new age where mobile is absolutely key. Ensure that your mobile experience for your audience is seamless and geared towards in the moment decision making that will lead them to the action you desire. I'm not sure if this is going to a whole new subset of digital marketing, or even marketing as a whole – this in-the-moment intent marketing. 'Intent marketing' if I dare to call it that has always been around. You've seen it in stores with the 'impulse buy' aisles. But today, it's just become imperative because consumers have 24/7 access to content and information. It's an easy bet to win when we accept that today's consumers are different, they want solutions right away, and that loyalty to brand is second fiddle to solutions at the right time by anyone. Excellent article. All consumers have specific needs at specific times. If we are able to meet those needs it just helps to better connect with them. This helps us plan our consumer engagement better when it is based on their needs. Demographic targeting is such a broad net to cast, whereas, as you say "in-the-moment" is far more likely to succeed because that is exactly what the target wants at that time. Love the header. Great post title. Good content as well. you share in this blog digital marketing as well as mobile marketing. it is very helpful information.thank you for sharing this information.